BEAUMONT, TEXAS (February 25, 2017) The Lamar Cardinals took a 38-9 lead into the locker room at halftime and went on to down the HBU Huskies by the score of 74-22at the Montague Center in Beaumont, Texas on Saturday, February 25, 2017. The Huskies, who shot 27% from the field and seemed to not be able to find the basket; completed 7-of-34 from the field and 0-11 from three-point range. Guard Shannon Jones came off the bench to lead HBU with six points while starting forward Taylor Kollmorgen scored five points while pulling down 11 rebounds. The closest the game was at the 5:55 mark in the first quarter, when the score was tied at two. From that point on, the game was all Lamar, who outscored the Huskies 11-4 in the first quarter, 29-5 in the second, 24-6 in the third and 10-7 in the fourth. Starting center Kiandra Bowers led the way for the Cardinals, scoring 13 points and pulled down 10 rebounds, in 20 minutes of play, for her 16th double-double of the season. Chastadie Barrs tallied her first double-double of the season, tallying 11 points and 11 rebounds in 33 minutes. Two additional Cardinals scored in double figures, with Ashlan Miles scoring 11 points, followed by Moe Kinard with 10. The next opponent for the Huskies will be Texas A&M-Corpus Christi on Wednesday, March 1. They will return to the f friendly confines of Sharp Gym on Saturday, March 4 for their final regular conference game against Abilene Christian. Lamar next hosts Nicholls on March 1 and travels to McNeese State on Saturday, March 4. The Southland Conference Tournament, which is scheduled for March 9-12 at the Merrell Center in Katy, Texas. HOUSTON, TEXAS (February 24, 2017) Following a big 3-2 win over the No. 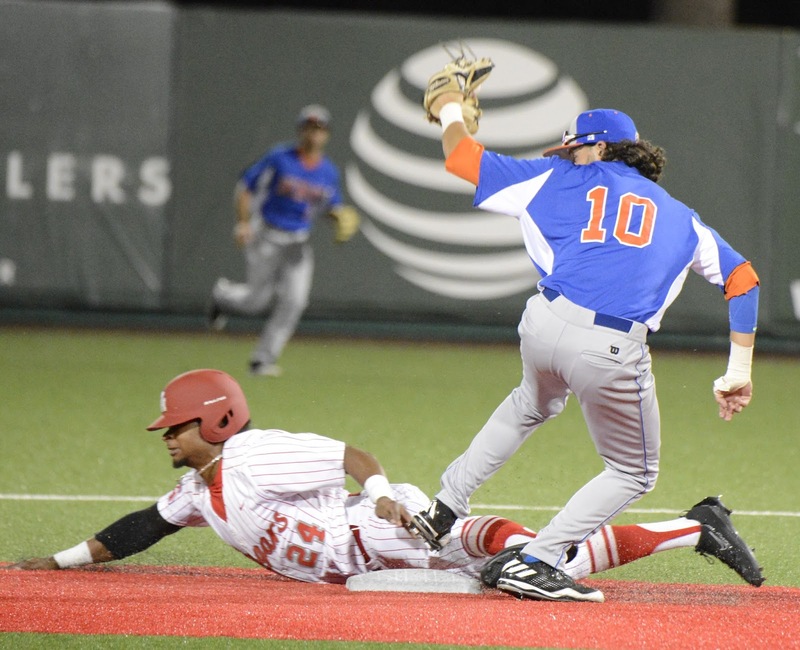 19 Houston Cougars on Tuesday evening, the HBU Huskies began a three-day, four game series against the Rhode Island Rams on Friday, February 24, 2017 at Husky Field in Houston, Texas. In the first game of the series, the Rams downed HBU 5-4. The Huskies wasted little time getting on the scoreboard, scoring three runs off two hits in the first inning. The Rams answered in the second inning with a single run, giving the Huskies a 3-1 lead after two innings. 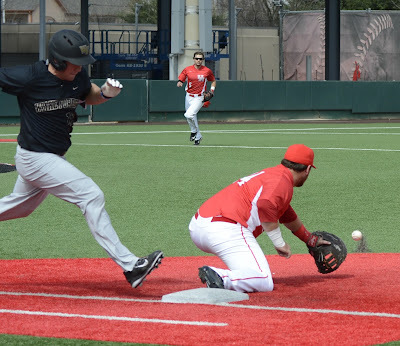 The score remained at 3-1 until the fifth inning, when the Rams connected for three runs on three hits to take a 4-3 lead. The Rams shut down the next nine Husky batters with only single batter reaching base, who was picked off attempting to steal second. HBU put a man in scoring position in the eighth inning when right fielder Brandon Brintz singled and advanced to second base on a sacrifice bunt by Austin Zillweger. He advanced to third base when a balk was called on Ram reliever Vitaly Jangols. Blake Thomas came to the plate, with two runners on base. He connected on a 0-1 pitch to right fielder, sending Brintz home from third to tie the score at four. Rhode Island took back the lead in the ninth innings when right fielder Sam Ilario scored on a single by Brett McManus. Ilario reached base when he was walked by Husky reliever JT Jakubik. Ilario promptly stole second base and advanced to third on a wild pitch. HBU got a runner to third base in the bottom of the ninth innings, but failed to get him home to close out the game. Jangols received the win for the Rams with Jakubik getting the loss for HBU. Barss, pitching one inning of relief, received the save. The Huskies and Rams will continue the weekend series with a double-header on Saturday, February 25 with a 11 a.m. and 2 p.m. start times. and had nine rebounds against UConn. HOUSTON, TEXAS (February 22, 2017) The UConn Huskies jumped out to a 39-29 lead at halftime and but could not contain the offense punch of the Houston Cougars in the second half and dropped a 75-70 decision at Hofheinz Pavilion in Houston on Wednesday, February 22, 2017. The Cougars raised their American Athletic Conference record to 10-5 with three games to go on their regular season schedule. The win placed the Cougars in sole possession of third place in conference standings. 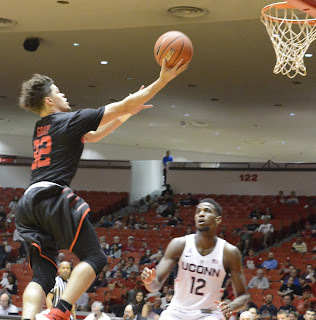 Rob Gray (32) scored 16 of UH's 75 points. The Cougars, who seemed like a different team in the second half, outscored the Huskies 46-31 in the final 20 minutes. 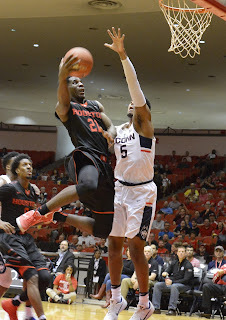 Starting guard Damyean Dotson, who scored 25 points and pulled down nine rebounds, led the Cougars in scoring. 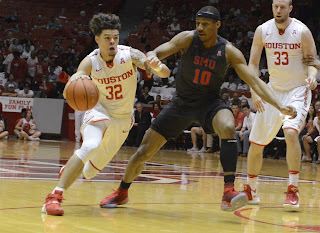 Rob Gray tallied 16 points in Houston's winning effort with Devin Davis adding 11. Kyle Meyer, who seemed to be all over the court scored nine points with 11 rebounds. The Huskies had three players in double-digits; Jalen Adams (18), Vance Jackson (16) and Rodney Purvis (11). Houston head coach Kelvin Sampson was talked about the Cougars performance after the game. “Obviously UConn did a good job of punching us in the first half. I didn’t think we responded well. In the second half, there was no raised voices, no panicking. If we are the better team, then we are going to win, and we felt like we were. We came out and made some adjustments to our zone. Our zone was a better force in this game coming in because of Jalen Adams’ ability to get in the paint. He’s really good in the pick and roll so we made a couple adjustments in our zone. We started competing harder. It really comes down to what you say or do at halftime. Simple adjustment of the zone and staying with it. These two guys, Kyle Meyer and Damyean Dotson are playing like seniors. Kyle Meyer played his best game since he’s been here. Dotson got back on the boards. For people to say that Dotson is just a scorer are losing sight of what he is really good at. Last couple games he hasn’t, but Dotson is only one of two guys that is ranked in the top 10 in scoring and rebounding in this league. Look at the position he plays, that is pretty special. We played smart but we did not shoot the ball well. Rob (Gray), Galen (Robinson) and Wes (VanBeck) were 3-22. Digest that for a minute, two of them are outstanding shooters. Rob 3-10, Wes 0-4 and Galen 1-8. Our back court was 3-22 and we won the game. It’s because we defended and rebounded. Look at their (UConn’s) size, how big they are. We won the boards. If Dotson didn’t get 9 and Kyle didn’t get 11 we aren’t going to win the boards. The combination of Devin (Davis) and Danrad (Knowles) was really well tonight. Devin and Danrad did some good things. Collectively, they were pretty good. It’s good to get to 19 wins. It’s good to get to third place and get to our 10th conference win. 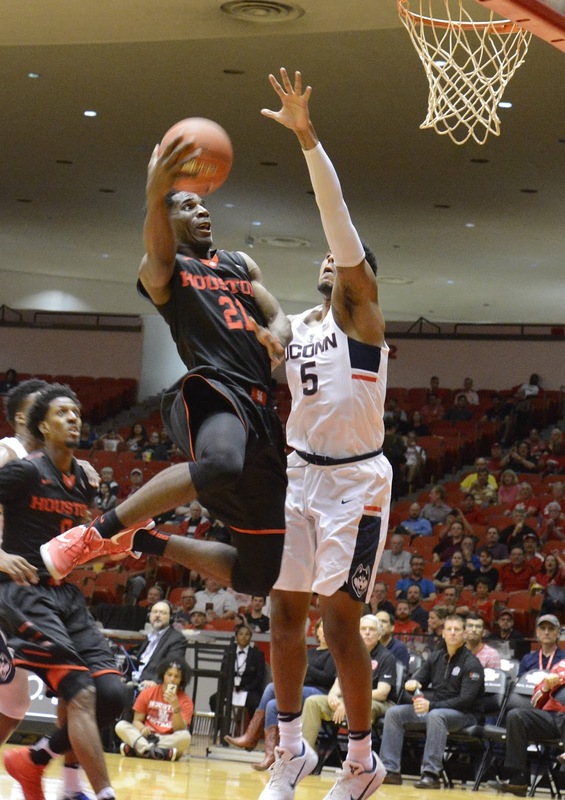 It is that time of year, as soon as the game is over"
Houston is 2-0 against UConn this season, beating the Huskies 62-46 on December 28, 2016 at the XL Center in Hartford, Connecticut. Next up for the Cougars is a February 26 match-up against Memphis and a March 2 game against No. 15/16 Cincinnati. Both games are on the road. They will return to Hofheinz on March 5 for their final regular season game against East Carolina. For Houston, Connor Wong went 2-for-5 with an RBI a run and three stolen bases for the Cougars (3-1). Corey Julks went 2-for-2 with a triple and a pair of walks and Lael Lockhart went 2-for-4. HOUSTON, TEXAS (February 19, 2017) The No. 20 Houston Cougars kicked of their 2017 baseball season with a 3-0 record on opening weekend at Schroeder Park in Houston. The Cougars faced the Wake Forest Demon Deacons on Friday, February and Sunday, February 19. On Saturday, they took on the Nicholls State Colonels. In the Friday evening matchup, Houston used 14 hits to generate eight runs to down the Demon Deacons by the score of 8-1. Starting pitcher Seth Romero fanned 12 batter in route to his first win of the season. The junior left-hander who hails from West Columbia, Texas, saw six innings on the mound, faced 24 batters. Left fielder Grayson Padgett was three-for-five at the plate, scoring one run and tallied four RBI. In the Saturday game against Nicholls State, the Cougars posted their second 13-plus hit game in downing the Colonels by the score of 5-3. Starter Mitch Ullom gave a solid performance, combining with relief hurler Joey Pulido to strikeout seven without give up any walks. Offensively, Padgett was three-for-three with one run and a single walk. In their final game of the weekend, Houston jumped out to a 3-0 lead after three innings, and held on to down Wake Forest by the score of 5-4. The Demon Deacons put two runs on the board in the fourth to cut the Cougars’ lead to 3-2. Houston answered in the bottom of the inning with a single run to increase their lead to 4-2. The scored reaming 4-2 until the eighth, when Wake Forest took advantage of Houston on a balk and used three pitchers in the inning, to add two runs to their total and tie the game at four-all. Houston regained the lead in the bottom of the inning with a Padgett double, on a 2-1 pitch, to right center field, allowing Conner Wong to score from third base. The Cougars went into the ninth inning with a one-run lead and held on to post a 3-0 mark to start the season. Next up for the 3-0 Cougars will be a Tuesday, February 21 game against cross-town opponent Houston Baptist University. The Huskies completed their opening weekend with a double header on Saturday and a single game on Sunday against Fordham. 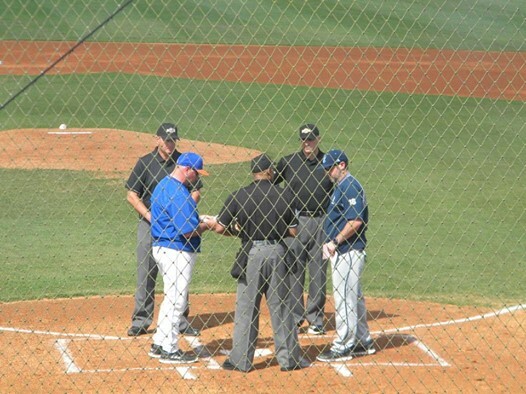 In the Saturday double header, HBU dropped the first game 4-3 and came back to win the afternoon game by the score of 13-5. Sunday’s game raised the Huskies record to 2-1 with a 7-6 win over the Rams. HOUSTON, TEXAS (February 18, 2017) The Houston Cougars women’s swimming and diving team used six medal-platform finishes to power them to the 2017 American Athletic Conference Championships title at the Campus Recreation and Wellness Center in Houston on Saturday, February 18, 2017. The conference championship was the first for the Cougars in program history. Head coach Ryan Wochomurka and diving coach Bob Gunter were selected as the Coach of the Year, with junior Micaela Bouter being awarded the Diver of the Meet honors. Houston scored 772 points in route to their title, followed by 2016 champion SMU with 676 points. Cincinnati (625), East Carolina (473), Connecticut (460) and Tulane (395) rounded out the team placing. Wochomurka talked about the Cougars’ performance after the meet. Next up for Houston will be the NCAA Zone Diving Meet on March 6-8 in Columbia, Missouri, which will determine the qualifiers for the NCAA Championships on March 15-17 in Indianapolis, Indiana. HOUSTON, TEXAS (February 18, 2017) After leading the SMU Mustangs by 13 points at the 10:23 mark in the first half, the Houston Cougars fell behind in second half scoring and dropped a 76-66 decision to their American Athletic Conference rival at Hofheinz Pavilion on Saturday February 18, 2017. The 8,479 fans in attendance saw the No. 19 Mustangs outscore the Cougars 50-36 in the second half to secure the win and remain atop the conference standings. Houston head coach Kelvin Sampson talked about the game in the post-game presser. Houston had three players in double figures. Rob Gray led the way with 23 points, followed by Damyean Dotson with 19 and Galen Robinson, Jr. with 11. Gray also tallied six rebounds. The Mustangs were led by Semi Ojeleye with 22 points along with Ben Moore with 18 points and 13 rebounds. With the win, the Mustangs stay atop the conference standings with a 14-1 record. They are followed by Cincinnati in second place (13-1) and Houston (9-5). The Cougars will face fourth place Connecticut (8-5) on Wednesday, February 22 at home with an 8 p.m. tip off. Junior 1B/C Jake Pulcheon goes 5-for-6 on the day. HOUSTON – HBU rebounded from a 4-3 loss in the season opener to hammer out 17 hits en route to a 13-5 victory to split a non-conference baseball doubleheader with Fordham Saturday afternoon at Husky Field. In the second game, junior catcher Jake Pulcheon went 3-for-3 with an RBI and a run to cap a 5-for-6 afternoon for the Huskies (1-1). Junior centerfielder Spencer Halloran went 4-for-5 with a double, three RBIs and a pair of runs, while junior first baseman Carey Jones went 2-for-5 with a double and two runs. Senior rightfielder Brandon Brintz went 2-for-6 with a double and scored twice and senior leftfielder Joe Van Marter blasted a three run homer and scored twice. Alvin Melendez also had a three-run homer and scored twice for Fordham (1-1). Brian Goulard went 2-for-4 and scored twice. Sophomore righthander Zach Carter (1-0) picked up the win for HBU, allowing four runs, three earned, on five hits with seven strikeouts and a walk in 5.0 innings. Junior Weston Smart tossed two scoreless innings in relief. Jimmy Murphy (0-1) took the loss for the Rams, giving up eight runs, seven earned, on nine hits in 2.1 innings. Fordham used five other pitchers out of the bullpen. In the first game, Pulcheon went 2-for-3 and scored a run, while senior catcher Blake Thomas went 2-for-4 with a run for HBU. Senior third baseman Austin Zillweger went 2-for-3 and drew a pair of walks and junior shortstop Tyler Depreta-Johnson went 2-for-4 with an RBI. Halloran tripled, scored and drove in a run. Luke Stampfl went 4-for-4 and scored a run for Fordham. Brian Goulard added a double and an RBI. Reiss Knehr (1-0) earned the win, shutting out the Huskies on four hits over the final 3.2 innings. Starter Mike Cowell allowed one run on four hits with four strikeouts and three walks in 4.0 innings. Senior lefthander Christian Thames took a no-decision, allowing two runs on six hits with two strikeouts and a walk in 6.0 innings. Junior Cody Marshall (0-1) received the loss, allowing two runs, one earned, on one hit, in one-plus innings. HOUSTON, TEXAS (February 16, 2017) The HBU Huskies kept the conference tournament seeding hopes alive with an 88-77 upset of the Sam Houston State Bearkats at Sharp Gym in Houston on Thursday, February 16, 2017. The win pushed the Huskies to 8-6 in conference action and 12-12 for the season. The Bearkats fell to 9-5 in conference and 18-9 overall. The game, which was televised on Root Sport, saw four players hit in double-digits; Atif Russell and Braxton Bonds with 18 points each followed by Colton Lasher and Josh Ibarra with 15 each. Reveal Chukwujekwu tallied 10 rebounds to lead HBU. With the win, the Huskies have fifth place in the conference standings, with Sam Houston holding on to fourth place. New Orleans hold the top spot followed by SFA and Texas A&M-Corpus Christi. The Huskies have four conference games remaining on their schedule, including a February 23 matchup against McNeese and a February 25 game against Lamar with both those games are on the road. They close out the regular season with two home games; March 1 against Texas A&M-Corpus Christi and March 4 against Abilene Christian. HOUSTON, TEXAS (February 16, 2017) One of the classiest players to take the pitch for the Houston Dynamo or the world for that matter retired after a storied career in Major League Soccer. 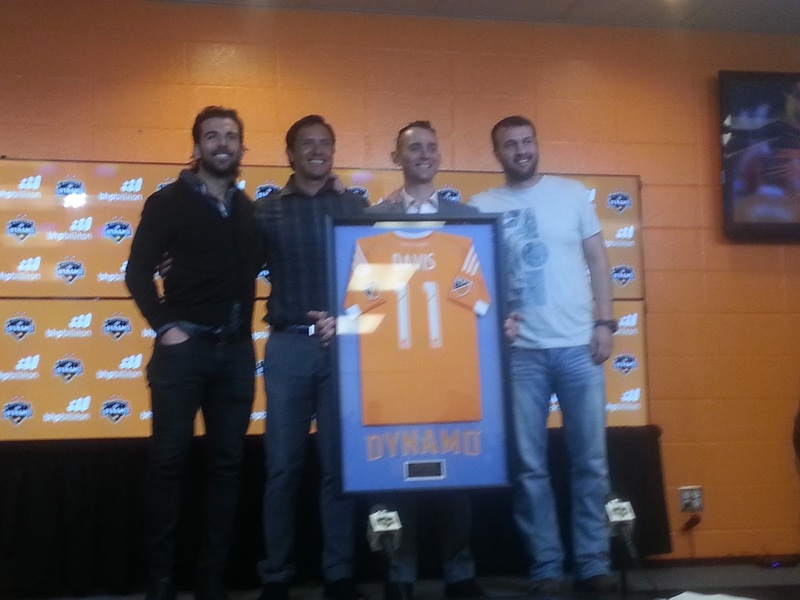 In a ceremony packed with former players, assembled media and a plethora of others, Houston Dynamo legend Brad Davis called it quits after 15 seasons. Davis’ name appears in the Houston Dynamo record book more than Dynamo president Chris Canetti had time to go through on Thursday afternoon. He was celebrated like the star that he was and is both on and off the field. Few will remember that Davis’ career actually started with the New York MetroStars. Even fewer as Davis alluded to following the press conference to announce his retirement would remember the name New York MetroStars. Even fewer than that will know that Canetti was with the MetroStars when Davis arrived in 2002. Eventually both would move on before reuniting back in Houston in 2006 as the Earthquakes arrived in late December and the Dynamo became a reality. Davis and his left-foot would capture the imagination of the city winning back-to-back MLS Cup titles and reaching four finals in his ten years. The former midfielder said that he wasn’t gifted with athleticism, speed or height but God did gift him with a talented left foot. With more corner kicks to his credit than any player in MLS history, Davis also ranks at or near the top of record books ranking third in assists (123), fourth in games played (392), eighth in games started (339), and 10th in minutes played (29,577). Davis will be honored by the Dynamo on July 5, 2017. POMONA, CALIFORNIA (February 12, 2017) Leah Pritchett blasted through the qualifying and eliminations rounds to take the Top Fuel title at the 57th Annual Circle K NHRA Winternationals at the Auto Club Raceway at Pomona, California on Sunday, February 12, 2017. The Redlands, CA native qualified for the elimination rounds as the number one qualifier with the time of 3.672 seconds (327.9 mph). In the final against number two qualifier Doug Kalitta, she posted the winning time of 3.711 (324.98 mph) against her opponent’s 7.630 (103.85 mph). She easily took the title for her Don Schumacher Racing Team when Kalitta experienced mechanical difficulties in the left lane. The win was the second of her NHRA professional career. In the Funny Car division, number one qualifier MattHagan (Don Schumacher Racing) blasted to a 0.026-second win over number three qualifier Courtney Force (John Force Racing). Hagan posted the time of 3.975 seconds (330.07 mph) to top Force’s time of 3.901 seconds (326.85 mph). In the Pro Stock division, number one qualifier Jason Line (KB Racing) took the title with a 6.568-second (211.10 mph) final run against number two qualifier Greg Anderson (6.658-6.579). Jay Turner was tops in the Top Fuel Harley division with a final run of 6.276 seconds (218.23 mph) over Rickey House (6.609 seconds). Next up on the NHRA schedule is the Arizona Nationals at Wild Horse Pass Motorsports Park in Chandler, Arizona on February 24-26, 2017.
with the framed tribute to Eddie Brown. 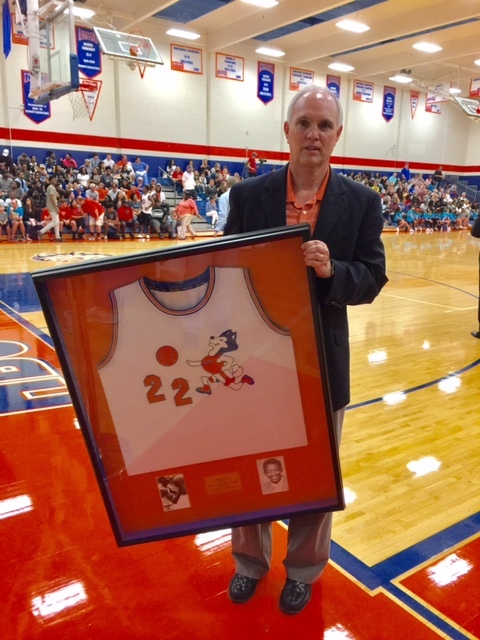 HOUSTON, TEXAS (February 11, 2017) The Houston Baptist University Huskies honored former player Eddie Brown during halftime of the HBU vs. Lamar men’s basketball game on Saturday, February 11, 2017. Brown, who passed away on February 13, 2016 is the Huskies’ all-time leading scorer with 1,939 points. 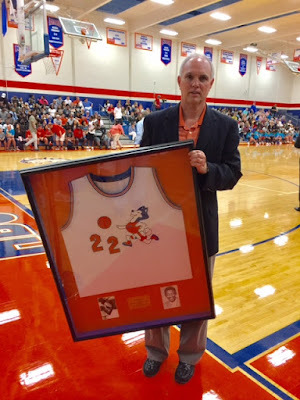 He played for HBU from 1968 to 1972 and hold numerous records in the history of HBU basketball. Brown had a career game high 41 points in HBU’s 81-78 loss to Bishop College on February 8, 1969. He is ranked sixth in team history in scoring average (18.8 points per game) and holds the record for free throws against Sam Houston State, with 20 in 1968-1969. I can't begin to express the sadness I feel, and our entire team feels, at learning of the passing of our dear friend and fellow Husky Eddie Brown. We lost a true legend and ambassador for HBU and our basketball program. Eddie was very involved in our program and a mentor to many of our young men over the years. We will miss him greatly. Heaven is enjoying a great exhibition of basketball talent and a person of true friendship tonight." HOUSTON, TEXAS (February 11, 2017) The HBU Huskies took a big step to stay in contention for the 2017 Southland Conference Men’s Basketball Tournament with a 94-87 win over the Lamar Cardinals at Sharp Gymnasium in Houston on Saturday, February 11, 2017. The Huskies relied on their starting five, who all scored in double figures, in addition to having two players achieving a double-double. Starting guard Colton Lasher tallied 20 points, with Braxton Bonds adding 12 and Asa Cantwell chipping in 10. Reveal Chukwujekwu and Josh Ibarra both had a double-double in the game, with Ibarra scoring 17 points and pulling down 12 rebounds; eight of them on the defensive end of the court. Chukwujekwu pulled down 10 rebounds while scoring 15. Alex Fountain, who came off the bench for 2 4minutes of play added 13 points to HBU’s total. HBU jumped out to a 44-28 lead at halftime with the Cardinals outscoring the Huskies 59-50 in the second half. However, Lamar’s final 20-minute performance was not enough to overcome their first half deficit. The Cardinals had five players on double figures, with Nick Garth coming off the bench to lead the team with 24 points. The Huskies out-rebounded Lamar 36-22 with the Cardinals holding the advantage in shooting (56%-49%) and assists (19-16). The Huskies began the game in a three-way tie with Central Arkansas and Southeastern Louisiana, with a 6-6 record in conference action. The win pushed HBU to 7-6 and a tie with Central Arkansas, who downed Nicholls 106-83 on Saturday evening. Southeastern Louisiana dropped a 60-52 decision to New Orleans; falling to 6-7. The top eight teams will advance to the conference tournament in Katy, Texas on March 8-12, 2017. The Huskies will remain home for their next two games. They will face Sam Houston State on Thursday, February 16 with a 7 p.m. CST tipoff. They will follow that up with a Saturday, February 18 matchup against the Randall Saints. HOUSTON, TEXAS (February 6, 2017) After training on Monday, February 6, 2017, Houston Dynamo defender Dylan Remick and forward Mauro Manotas spoke with the press and had some personal thoughts and statements concerning training camp. The Dynamo will close their training camp in the Rio Grande Valley on Tuesday, February 7, 2017 with a full match against the RGV FC Toros. HOUSTON, TEXAS (February 4, 2017) The HBU Huskies used 23 points from the bench, including 15 points by Atif Russell, to down the Incarnate Word Cardinals by the score of 84-70 in front of 864 fans at Sharp Gymnasium in Houston, Texas on Saturday, February 5, 2017. The win raised the Huskies to 5-6 in Southland Conference action as they stand in eighth place to qualify for the conference tournament in Katy, Texas. The Huskies had three more players in double figures; Braxton Bonds (22), Colton Lasher (19) and Reveal Chukwujekwu, who tallied a double-double with 14 points and 12 rebounds. HBU held a slight 38-35 lead at the half and really poured it on during the final 20 minutes, outscoring the Cardinals 46-35. UIW had four players in scoring in double figures with starting guard Shawn Johnson leading the way with 22 points. The Huskies will next hit the road for a Thursday, February 9 contest against Northwestern State with a 7 p.m. CST tipoff. HOUSTON, TEXAS (February 4, 2017) Led by the offensive punch of sophomore guard Lisa Zderadicka, the HBU Huskies downed Texas A&M-Corpus Christi by the score of 56-51 at Sharp Gymnasium in Houston on Saturday, February 4, 2017. The 5-6 native of Vienna, Austria came off the bench and in 16 minutes of play, tallied 23 points for the Huskies. Her performance against the Islanders was the second best of the season. She connected on 8-of-11 shots from the field, 3-of-4 from beyond the arc, and 4-5 from the free throw line. The Huskies trailed the Islanders at the half, 26-14 but that deficit was short lived. HBU rallied in the third quarter, outscoring their Southland Conference rival 21-10. The entered the final quarter of the game behind by a single point (36-35). In the final 10 minutes of the contest, they continued their offensive punch with a 21-15 scoring advantage, to give the Huskies their fifth win of the season and their third in conference action. Zderadicka was not the only standout player for the Huskies. Starting guard Heidi Byrd chipped in 10 points with Shannon Jones adding nine points along with nine rebounds. The Islanders has two players on double figures; starting forwards Dalesia Booth with 18 points and Ashanti Plummer with 12 points. Plummer also tallied seven rebounds for Corpus Christi. Next up for the Huskies is a February 9 match-up against Northwestern State in Natchitoches, Louisiana.